Nagy won the vacant WBFed Int´l middleweight title on scores of 96-94 twice and 97-93. Albert came in on short notice for Sandor Miscko. Molnar won the WBFed Int´l title on scores of 98-93, 96-94 and 95-94. 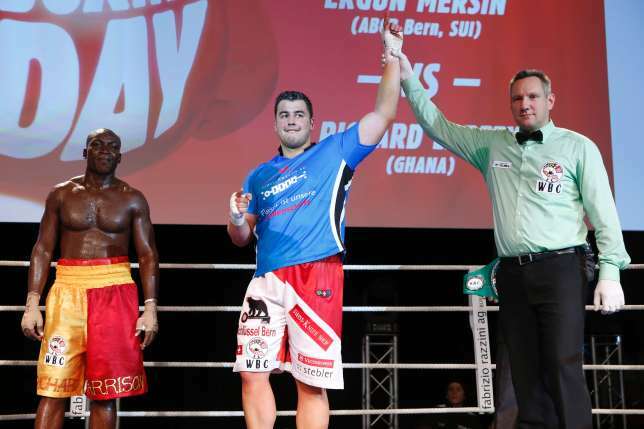 Petranyi lost the Hungarian heavyweight title and Csala also won the vacant WBFed Int´l title with an upset knockout of promoter Petranyi, who earlier in the month was stripped of the UBO Euro bauble. Bogdan won the vacant GBFed (US version) heavyweight title on scores of 99-91 twice and 100-90. Karasev was down twice in the first but got up and did well after that. Semjonov had a point deducted in the second for rabbit punching. Zutis had a point deducted in the third. Abselencevs was floored in the first and retired. Anosko was floored twice before it was stopped. Mersin won the vacant WBC Youth Silver heavyweight title. After four it was scored 40-36 twice and 39-37 for Mersin. 38-38 twice and 40-36 for Wojcik. Both Mischa Nigg and Alain Chervet had to pull out due to injuries. Tabaghua says he was food poisoned and entered the ring feeling weak and didn´t throw a punch. He began to throw up after the second round and the fight was stopped in the corner. Krasniqi retained the WBA Continental and WBO Int´l titles on scores of 116-112 twice and 115-113. It was probably a tougher fight for Krasniqi than expected but he came through and might now get a world title shot. Second stoppage loss for Buharlija inside eight days. Di Luisa won the vacant EU supermiddleweight title. Slow start by Oezen but in the fifth he opened up and the towel came in. Ilic floored three times in the second.